Has Disney made a comeback? Disney animation had a rough go of it in the 2000s. After spending decades as practically the only game in town when it came to animated features, the landscape began to change quickly and drastically in the last 10 or 12 years. The rise of Pixar -- whose films Disney was at least distributing, and therefore could share in their success -- revolutionized not just how animated features were made (on a computer instead of by hand), but also just how successful they could be at the box office. Soon, every major studio had its own animation division as the profits for feature-length cartoons skyrocketed, often going on to be many of the highest-grossing movies of a given year. And rather than adapting to this sea change, Disney was floundering creatively. They continued to make boatloads of money thanks to merchandising, their relationship with Pixar and a steady output of direct-to-DVD sequels that cannibalized their previous classics, but that hardly made them relevant. If anything, it diluted the brand. They continued to make animated features, sure, but it was clear that their second Golden Age (the one that kicked off with The Little Mermaid in 1989) had come to an end. Movies like Atlantis: The Lost Empire and Treasure Planet were costly failures, and even The Princess and the Frog -- the studios attempt to bring back traditional cel animation at a time when computer animation had become the standard -- failed to become the new classic everyone was hoping for. The company name was basically being held up by Pixar. But between last year's excellent Wreck-it Ralph and now Frozen, Disney animation has returned to form. Whereas Wreck-it Ralph felt funny and current, Frozen is timeless -- it's the studio's first film in a long time that deserves to stand alongside many of their classics, and it's for reasons beyond the fact that it's based on traditional source material (Hans Christian Anderson's The Snow Queen) and yet again centers on a princess. If anything, I'm quick to use the "princess" thing as a strike against the movie, but the screenplay (by Jennifer Lee, who co-directed with Chris Buck) is very smart about the way it subverts many of the outdated traditions of Disney movies. At the center of Frozen is the relationship between two sisters: Anna (Kristen Bell) and Elsa (Idina Menzel), both princesses of Arendelle. They're as close as young sisters can be, with one minor problem: Elsa has the magical power to create ice and cold with the touch of her hands. It's all snowball fights and games until her power nearly kills Anna. Their parents take Anna to see some trolls, who heal her by erasing the memory of Elsa's power, and demand that Elsa hide her abilities from the world. So Elsa holes herself up in her bedroom, ensuring that she never hurts anyone ever again. Fast forward several years. Elsa is being crowned the new queen of Arendelle, while Anna is announcing her engagement to a man she's only just met. When Elsa doesn't approve and the sisters fight, her powers reveal themselves in a big, bad way and all of Arendelle is turned to ice. 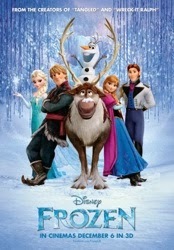 Elsa banishes herself to a frozen palace and Anna sets out to find her with the help of an ice trader named Kristoff (Jonathan Groff), his sidekick reindeer and a magical snowman named Olaf (Josh Gad). 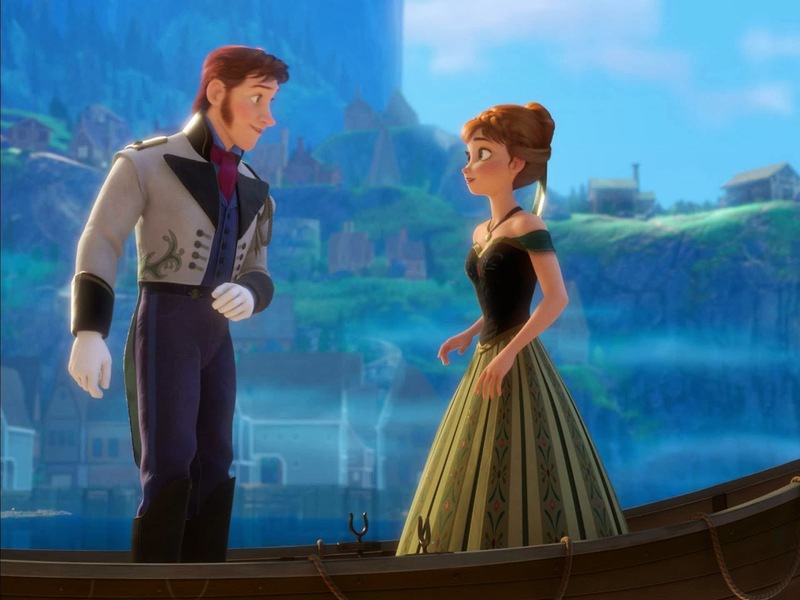 It's hard to talk about some of my favorite things about Frozen without getting into spoilers, but suffice it to say that the movie finds Disney catching up with 2013 and realizing that not everyone is defined by his or her romantic relationships. On paper, there's so much of the movie that feels like typical children's movie pandering. There's the funny magical snowman and a talking reindeer sidekick and an ice monster that appears just to provide some excitement for a single scene. In practice, though, the movie is much, much better than that. Lee finds a way around the "talking animal" trope used in every Disney movie that actually makes one of the human characters more charming. Olaf the talking snowman should be an annoying and cynical attempt to sell toys and, truth be told, he kind of is. But he's also sweet and positive and really fun to have around. The ice monster thing I can't really reconcile, except to say that the movie is still a fairy tale dealing with magic powers. It's not like there's no reason for its existence. Do I wish that Frozen had committed more in one direction or the other? That it had gone even further with the fantasy elements or else removed them altogether? Sure, but I suspect that's a criticism that will melt away as I revisit the film in the future. And I will be revisiting it. I have a very young daughter, and I'd much rather expose her to Frozen than Sleeping Beauty or Snow White or The Little Mermaid, and I think all three of those are terrific movies deserving of their classic status. 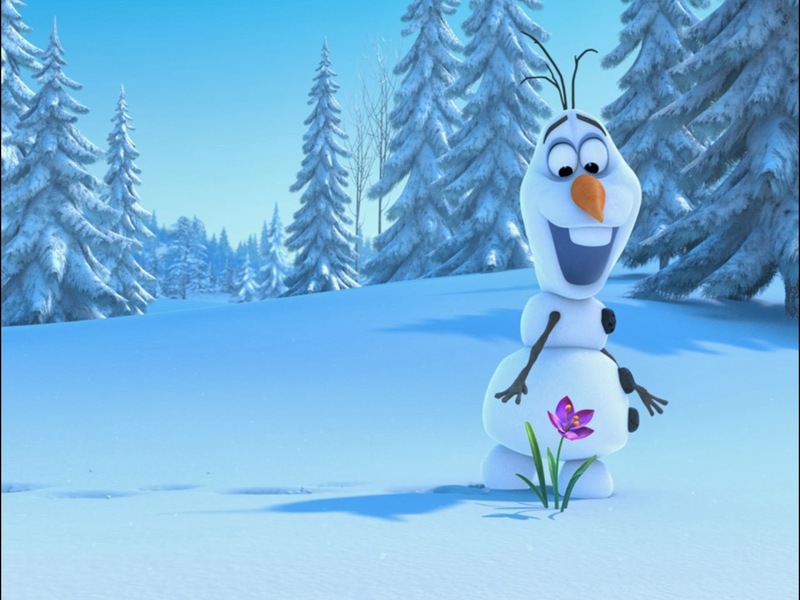 Because Frozen isn't really about talking animals or snowman sidekicks or ice monsters. It's about the relationship between two sisters, presenting two well-realized women who aren't quite alike but who love one another anyway. What feels fresh about Anna (fresh as far as Disney movies, that is) is that she has agency and a sense of adventure without just trying to be one of the boys. She wants to find love, but it does not define her. She's one of the best Disney princesses in a long time. She's such a good character, in fact, that much of the supporting cast suffers in comparison. Even Elsa gets something of the short shrift, mostly because she's relegated to moping in an isolation of her own making for most of the film -- and, as voiced by Menzel, a bit on the overly theatrical side for my liking. While Elsa doesn't always work as well as a character, she's the most interesting thematic device in the movie. Frozen is full of messages about being "different" or feeling like an outcast, and about how families can still love and support those who feel that way. It's interesting subtext -- Queer Theory scholars will have plenty to say about the movie -- but never gets laid on too thick. I'm sure musical theater fans will see shades of Wicked in the movie, as it's about one "good" sister and one sister who is labeled a freak and feared as something evil. She's played by Idina Menzel, no less. Frozen isn't really interested in exploring concepts of good and evil, though. It's more about people fearing what they don't know, and how we wrongly can want to shut out and hide those things that make us different. I haven't even mentioned the songs, which are really great. I resisted them a little at first because they sound more contemporary than I'm used to hearing in Disney "classics." Then I realized that it's all part of what makes Frozen special: it has many of the characteristics of traditional Disney animated features, but updates them so as to feel classical without feeling old-fashioned. It never tries to be super current -- there are no pop culture references (thank you) and there's no "NOT YOUR PARENTS' DISNEY" attitude on display -- but the movie feels more contemporary than I expected. It's true across the board, whether it's in the music, the animation (I know computer animation is the standard now, but I dream of a world in which Frozen is released hand-drawn) or in the characterization of the two princesses. It's truly a fairy tale for today. Ignore the marketing for Frozen, which is selling a movie about a snowman and a reindeer who both want a carrot. Instead, trust the newly-restored Disney brand and the incredibly positive word-of-mouth the movie is getting. Imagine that: a $150 million animated feature from Disney that's going to be a big hit because people are actually liking it. I know I did. Unfairly or not, I get a "Tangled" vibe from "Frozen" previews. I actually liked "Tangled"(which predates "Wreck-It Ralph" and was a huge hit for Disney Animation), but yeah, I agree, the marketing is terrible. Yeah, I forgot about Tangled. That's really the movie that seems to have helped right the Disney ship. I like that movie, too. We almost didn't see Tangled, because of the marketing. I didn't see Frozen, because of the marketing. My wife saw it, and said it was much better than she'd expected. Why is Disney producing good movies, but making them look like garbage? That's my question. I think they're just marketing them straight to kids? Which is weird, because kids will want to see them no matter what, right? Maybe not. Turbo bombed. But yes, you would think that if they made them look good to adults, too, those adults would be much more inclined to bring their kids. I might be wrong but it seems like Disney plays up the elements that will best sell merch. E.G. They can sell princesses and snow men wheras Turbo might have had a problem for Dreamworks because no one wants a snail backpack. That would be redundant because snails have shells. Can you imagine a backpack on a snail? That would be crazy. Now I can't imagine anything else. I thought this was a movie about playing football with a snowman's head. I've noticed that I've been unimpressed with a lot of trailers this year. But when the movie is good, it gets a boost for overcoming all the obnoxious marketing, at least for me. When a good movie has a good trailer, it's a no brainer, but when it surprises you, you're willing to lavish a tiny bit more praise upon it. So could it be that, along with selling merchandise (I love them, but let's face it, Disney is evil) Disney purposefully withheld the great elements of the movie from the previews in order to surprise us a little and earn that extra word of mouth? While I think I enjoyed Monsters University a little more than Frozen, I was still thoroughly impressed with the tweaks it makes to the standard Disney princess tale. My quibble with the movie is that it comes off almost as too Broadway-ey, if that makes any sense. I liked most of the songs, but they didn't come together to tell the story as fluidly as some past classics like Beauty and the Beast. "Love is an Open Door" and "Fixer Upper" are sweet and kind of clever, but I was distracted by them. On the flip side, the "Let It Go" sequence is definitely one of my favorite scenes of the year. I agree that Menzel is a bit too theatrical in the role, but the way that sequence comes together brought a tear to my eye. As a lifelong fan, I'm glad to see that Disney is becoming great again. Frozen has its ups and downs, but it still speaks to those simple ideas that we all treasure about love, friendship, and growing up. Agreed about "Let It Go." That's one of the best (if not THE best) songs in the movie because it really comes out of character -- it's not a "stop the movie so we can sing" moment. Though I thought "Do You Want to Build a Snowman?" was very sweet and then sad and actually advanced the story. But yes, "Let It Go" is one of the very best scenes in the movie. Glad to hear so many people are liking the movie. The reindeer doesn't really talk; his owner provides both voices. Is that in response to me? Because I thought I mentioned that. We saw the movie this past weekend with a packed house in our small town theater (a rarity) and I really loved it. I felt the same as Myke about the songs. They made the movie seem like a preview for Frozen: The Musical, but I'm okay with that. The talking snowman was consistently amusing and worth including for "In Summer" alone. On paper I should like Wreck-It Ralph more because it's about video games I played as a kid, but I can already tell that Frozen is a movie that will be playing in my house for years to come. "Timeless" is a great way to describe it. Even better because of the way it effortlessly updates the princess model for the modern world. Disney princesses have needed a new baseline for a while (see the uproar over the Merida redesign earlier this year). I'm surprised people aren't talking more about the great Mickey Mouse short. It did what Raimi tried to do with Oz earlier this year, only better. I'm pretty sure a few audience members gasped when old Clarabelle lifted her skirt to flag down the car. I can see how people unfamiliar with the "show the leg" trope could see that as a Sharon Stone moment. I feel terrible because I did not get to see the Mickey Mouse short and have heard it's GREAT. Maybe I'll show up early for the next movie I go see and try to pop into a showing of Frozen to catch it. In that case, retroactive (SPOILERS) for what I wrote above. The opening short is pretty darn clever and well done, I will agree. The short is also include in the Blu-ray, which was just released. Worth the watch. Yes! I will finally get to see it. I am so excited to see this movie; it comes out Friday here in the UK. I can't tell you how long I have been hearing about it whilst in development. I am a huge fanzel so have been very enthusiastic about her being in the film. She was in Enchanted, and to that I say, who has Idina Menzel in their musical, without making her sing? (I did enjoy that film though.) Joking aside, I was also eager to see it because I thought, from what I heard, it did explore some of the themes you pointed out and I am relieved to hear it does that so well. I'm sorry I can't join in the discussion about the film itself but I can say this, I do hope that the credit version of Let it go was offered to Demi Lovato as a gesture, considering how the lyrics are quite significant when thinking about her previous relationship to Disney. If you want to know more about that, I would recommend watching her powerful and brave documentary, Stay Strong. It is great that they got such strong anti - bullying campaigner involved (I am also an incredibly biased Lovatic). I think the lyrics connect strongly with both Idina and Demi, so that is why the song already has an emotional significance to me, even without seeing the scene. Those lyrics, knowing some of the stories of the people who sing them, a few life experiences, as well as their strong vocal performances. left me repeating Demi’s version for quite a while. I am now repeating Idina's version (now the soundtrack is available). I have a feeling that scene is really going to get me when I see it. Frozen is awesome. I saw it yesterday and really enjoyed it quite a bit. The story, songs, humor, and animation, as well as the dramatic moments that propel the plot, are all great. Even the Mickey Mouse short beforehand is pretty cool, as Erich mentioned. It's definitely worth seeing if you're a Disney fan and somehow have missed it so far, or really if you're a fan of quality animated movies in general. I will agree with Myke and Patrick that "Let it Go" is absolutely the best song among a few great ones. I loved Menzel and felt that her voice was appropriately showy and awesome for that scene. You also make a good point about it feeling contemporary without going overboard. If they had inserted all kinds of pop culture references, a la Shrek, I would probably have at least hated that aspect of it, and I'm glad they completely avoided that. Oh, I also wanted to say that "Do You Want to Build a Snowman" was excellent, too. I felt myself almost tearing up during that song, and I loved how it helped play out the story. It's hard to believe this is now the highest grossing animated movie ever made. Pixar must be pissed. 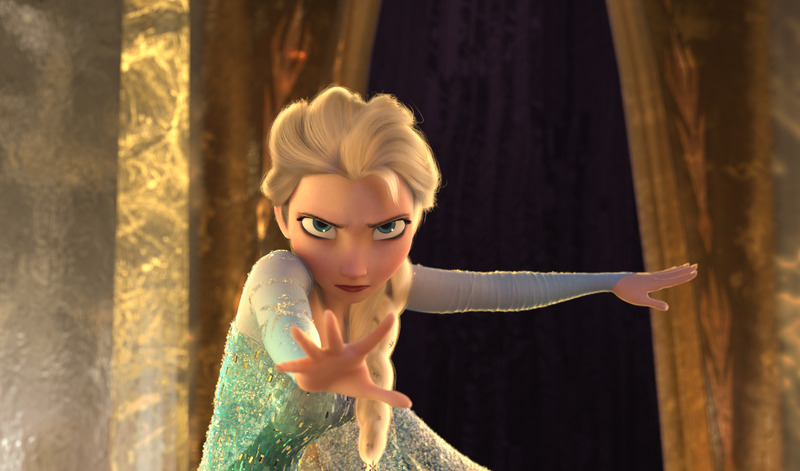 I just want to chip in three years after the fact with one tiny comment: to me, Let It Go is the least interesting song in the movie (well, apart from the trolls song) and I'd take any song of the ones sung primarily by Anna over it any day of the week. But that's just a case of different strokes for different folks, I'm sure. Anyway, it's always fascinating how people can have diverse opinions on the same things, and even like the same things for entirely different reasons. That's it.